I don't see an end to this lavender obsession of mine. And I don't really care. If the cookie looks a little familiar, it’s because they’re from the same batch as these, just in the shape of the Eiffel Tower as opposed to little bumpy rectangles. The Eiffel Towers were actually the “original” shape I made – the rectangles were just to use up some of the dough (and they were a LOT easier to cut out). I even still have a lump of dough in the freezer. The Eiffel Tower cutters are part of a set of little world landmarks given to me by my best friend this past Christmas. Originally I just wanted to make cookies with each that reflected the flavors of that particular region, but I may (all right, probably will) end up going all out and making cookie-topped cupcakes for each one. We’ll see. Ooh lala, you brought friends! There was no reason behind these cupcakes really – it was just an idea I had. They were a bit of work considering the cookies, but were light, sunny and delicious. The two main flavors are lavender and meyer lemon, and the lemon really shines. I considered using a richer frosting given the French appearance, but they ARE already topped with butter cookies. And it's springtime. The lemon curd in the middle of each cupcake is by far the best curd I’ve tasted. It’s just incredibly flavorful – so good I saved the leftovers in a jar. Which I’ve been dipping a spoon into every once in a while. What? There is a bit of an unexpected flavor component in the cakes themselves. After making the spinach lasagna, I had some leftover fresh thyme from my mushroom ragu, and as thyme is sometimes used in French cooking (alongside lavender and other herbs in herbs de Provence, for example) I decided to finely chop some and add it to the cupcakes. As a result, the cupcakes are fragrant and subtly herbal, providing a great background for the meyer lemon flavor to really pop. Whisk together the zest, juice, sugar and eggs in a metal bowl. Add the butter and set the bowl over a saucepan of simmering water. Cook the curd for about 5 minutes, whisking constantly. Once it’s thick, strain it into a bowl. Press plastic wrap into the surface and poke a few holes for steam to be released. Refrigerate until chilled. Place the milk and Tbsp of lavender in a small saucepan and heat until it just boils. Immediately strain and set aside to cool. Finely chop or crush the remaining lavender and thyme. Cream the butter and sugar together in a stand mixer and sift the flour, baking powder and salt into a separate bowl. Add the herbs to the dry mixture. With the mixer on low, alternately add the dry and wet ingredients in two or three additions until well-combined. Turn the speed up to medium-high and beat in the egg whites until the batter is light and fluffy. Pour into lined cupcake tins and bake in a preheated oven at 350 for about 10-12 minutes, or until a toothpick inserted in the middle of a cupcake comes out clean. Allow to cool fully before filling. Once the cupcakes are cool, fill them with curd using the cone method, trimming the cones themselves into thin disks. You could use an injector but I find I can get more filling into the cupcakes this way, and as long as they are well-frosted it doesn’t matter if there’s a little “man hole cover” on the top of the cakes. Once filled, set the cakes aside. Place everything but the food coloring into a double boiler over simmering water. Whisk constantly until the sugar dissolves and the mixture is hot. Transfer to a stand mixer (I just put my mixer bowl over the water) and whip on medium-high until it is cool and forms soft peaks. Beat in the food coloring. 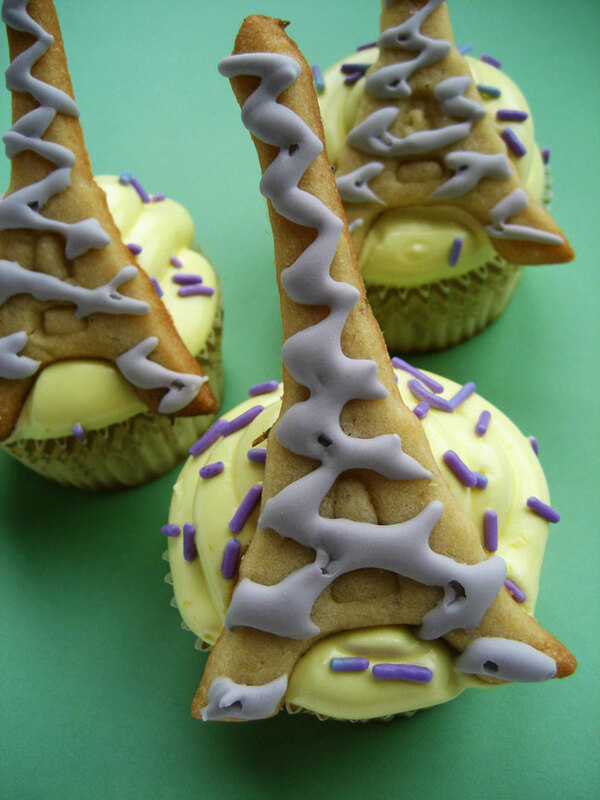 Put the frosting by fourths into a pastry bag fitted with the largest round tip you have and swirl it onto the cupcakes. 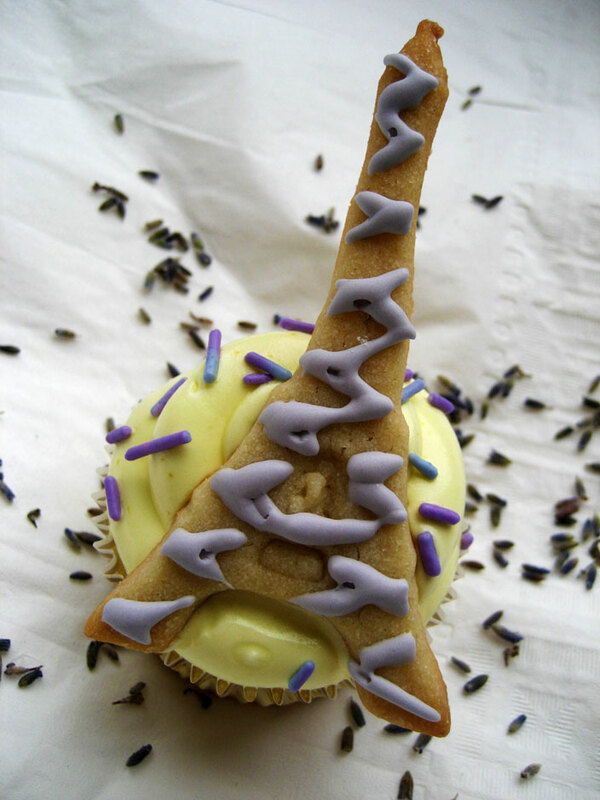 Top with lavender-colored sprinkles and Eiffel Tower-Shaped Lavender Roll Out Cookies. These cupcakes were well-received all around, and, more importantly, everyone was able to tell that the cookies were Eiffel Towers! Hooray! Watch out for another lavender-iffic cookie recipe, a picture-filled write up or my trip, my second attempt at homemade ice cream and lots more. Plus, by the end of spring I hope to move from this crappy blog to my very own domain under a much better name. Wheee! These are gorgeous~! 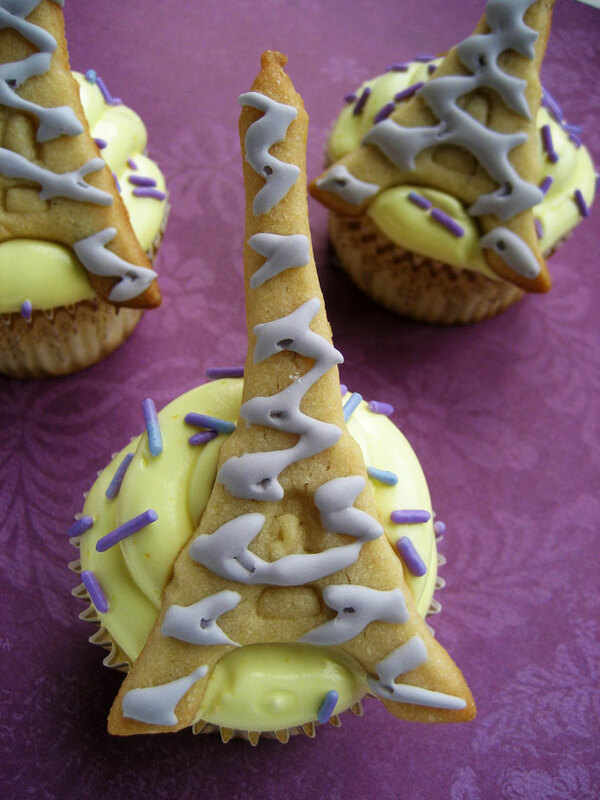 Would be great for a bon voyage party… Love them! 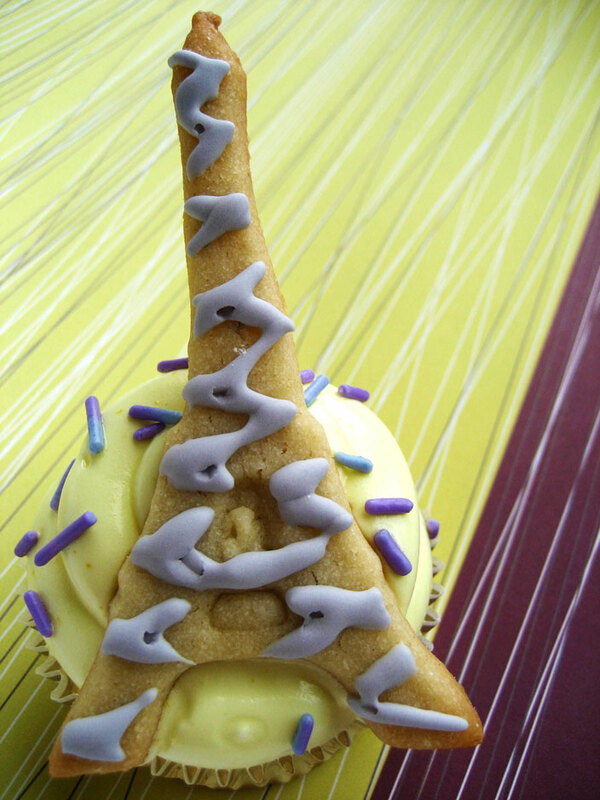 How darn cute…I love the Paris Cupcake!!! Work of art! I love Meyer lemon and lavender together and totally appreciate this recipe combo. Can’t wait to try them out! These are so Oooooh la la cute! Pretty! Love the colours too.